GALION — Galion Rotary Club members Cassandra Holtzman, Mo Ressallat and David Halsey speak to third-grade students at Galion Intermediate School on Nov. 28. The trio visited each third-grade classroom to present students with a new dictionary from the Galion Rotary Club. Courtesy photo Galion Rotary Club members Cassandra Holtzman, Mo Ressallat and David Halsey speak to third-grade students at Galion Intermediate School on Nov. 28. The trio visited each third-grade classroom to present students with a new dictionary from the Galion Rotary Club. 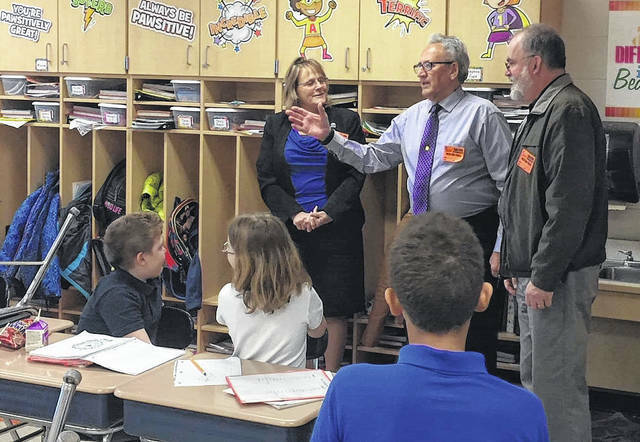 https://www.galioninquirer.com/wp-content/uploads/sites/38/2017/12/web1_galion-rotary-3rd-grade-dictionaries.jpgCourtesy photo Galion Rotary Club members Cassandra Holtzman, Mo Ressallat and David Halsey speak to third-grade students at Galion Intermediate School on Nov. 28. The trio visited each third-grade classroom to present students with a new dictionary from the Galion Rotary Club.